Venezuelan opposition leader Juan Guaido has reported his chief of staff, Roberto Marrero, was detained by the security officials during a pre-dawn raid on Thursday. On twitter, Guaido posted "They have kidnapped @Robertomarrero, my chief of staff”. He further detailed that the Caracas residences of Marrero and opposition legislator Sergio Vergara had been raided before dawn. In a televised broadcast Maduro said authorities were in the process of “dismembering the whole terrorist group and turning them over to the justice system” but did not mention Marrero or Guaido. Maduro has previously accused Marrero of planning attacks on senior political officials and described Guaido as a US puppet. The Venezuelan Interior Minister, Nestor Reverol, said on state television that officials had seized arms from Marrero during the raid which he claimed were “directly responsible for the organization” of criminal groups. Reverol showed an image of two rifles that Marrero allegedly had in his possession. 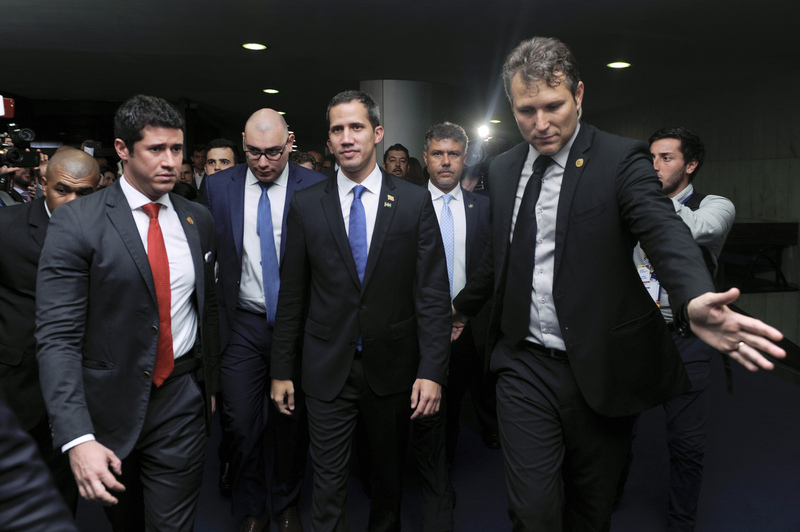 Guaido, responded to these accusations maintaining that the intelligence service had planted two guns and a grenade at Marrero’s home during the raid. Rights groups say Venezuela suffers from a long history of planting evidence to justify charges against opposition politicians and activists. The government denies these claims. Guaido maintains the attacks on those around him are a sign of Maduro’s weakness and are an attempt to intimidate the opposition. He told the press conference, “As they cannot take the interim president prisoner, so they seek out people closest to him, threaten relatives, carry out kidnappings”. Since the start of this year, Venezuelan authorities have arrested over a thousand people in connection with anti-government protests, Reuters and Al Jazeera reports.UN human rights chief, Michelle Bachelet, condemned this crackdown on Wednesday stating that Venezuelan security forces, backed by pro-government militias, have quashed peaceful protests with the excessive use of force, killings and torture. John Bolton, the current national security adviser for the US, has demanded the immediate release of Marrero, warning Maduro that he had made a “big mistake” and the arrest “will not go unanswered”. Bolton further tweeted, “The toughest sanctions are yet to come” and “Unless Maduro’s usurpation ends, he and his cronies will be strangled financially”. A U.S. State Department spokesman condemned the raids as a sign “Maduro is betting on repression to hold on to power. It will not stand. There will be consequences for a continued crackdown”. Currently, Venezuela is in the midst of a humanitarian crisis with a severe lack of food and medical supplies. Over three million citizens have fled Venezuela since 2015. In January, the US imposed harsh sanctions of Venezuela’s state-owned oil company, PDVSA, preventing U.S. companies from dealing with it unless revenues went to a fund available to Guaido. The US has not yet imposed secondary sanctions, which involves imposing sanctions on companies from other countries who would do business with PDVSA.